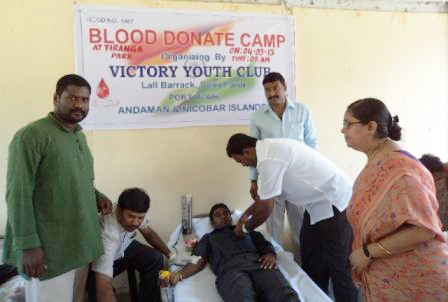 Port Blair, May 5: A blood donation camp was organised by Victory Youth Club, Lall Barrack, Dairy Farm at Tiranga Park today wherein Shri Kuldeep Rai Sharma, President, PCC was the Chief Guest. Sharma in his address on the occasion recorded his sincere thanks to the organizers for involving in social cause besides arranging various sports events for health, entertainment of the rural youths and housewives and children. On the occasion, a good number of young boys and girls were refused from donating their blood due to their less weight. The camp was supervised by Dr. Saina Mustakim while Smti Sunita Das, Sister and HK Rai, Counciller of GB Pand Hospital assisted the blood donation. Among the others present on the occasion were PBMC Chairperson, Shri PB Murugan, Club's President Shri K Mohan Rao, Secretary S Rama Rao and John Robert Babu, President Youth Congress.